After you have landed at the Hong Kong International Airport, a representative will meet and help you proceed to the hotel. Complete the check-in formalities and relax. Later, get ready for an entertaining evening Hong Kong city tour. Start the tour by visiting The Waterfront Promenade from where you can have unparalleled views of the Victoria Harbour. Next on your tour is a visit to the Jewellery factory and the cultural Aberdeen fishing village to view the contrasting image of the quaint yet modern Hong Kong. End the exciting day by visiting the spectacular Victoria peak. It offers awe-inspiring views of Hong Kong's cityscape. Return to your hotel for a night of sound sleep. Post a healthy breakfast, get ready to visit the largest sea theme park in Asia - The Ocean Park. This will be a fun-filled full day tour, offering thrilling water rides and a chance to view some of the fascinating underwater life that the country boasts of. Watch interesting marine life shows at the Ocean Theatre, especially the multi-sensory show - Symbio on a 360-degree water screen. Feel reinvigorated with the magnificence of these water creatures. Return to the hotel and stay overnight. On the third day of your Hong Kong tour, you will be picked up to visit the dreamy world of Disneyland. It is the perfect daay to let your inner child come out to play. Click pictures with your favorite Disneyland characters, visit the elaborate castles and film sets, and enjoy the show ‘Festival of The Lion King’. Try out thrilling roller coaster rides, for the ultimatee adrenaline rush. After the tour ends, you will be transferred to the hotel. Retire to your room and sleep off the night. Tip: On special occasions like Chinese New Year, Halloween and Christmas, Disneyland becomes a must-to-visit attraction on the Hong Kong list of places as these festivals are celebrated with pomp and show. Start your morning by savoring a delicious breakfast. It is now time to bid adieu to Hong Kong and proceed to Shenzen. Check-out from your hotel and get ready to be transferred to the rail terminal to catch a train to reach Shenzhen. On arrival in Shenzen, you will be transferred to your hotel. Complete the check-in formalities at the hotel and relax as you have all of today at leisure. Ypu can opt to stay in your room and relax, or go out and explore the different shopping options. Don't forget to try out the local dishes at the markets. After an entertaining day, return to the hotel and enjoy a restful night of sleep. 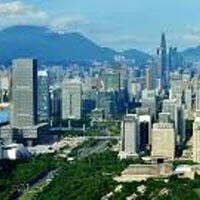 Get ready for an exciting Shenzhen City Tour, after you are done with breakfast at the hotel. Explore all the major attractions of this beautiful city today. You will visit Windows of the World - a historical theme park where the replicas of all the wonders of the world and heritage sites have been constructed. Pretend to be a giant in a land of midgets for the perfect photos. You will also be taken to enjoy the modern exhibition of the folk culture of China. After you have arapped up your tour, come back to the hotel and relax for the night.